The CRIBWARE® system is a powerful, yet easy to learn, easy to use, comprehensive crib management package. The CRIBWARE System is a total crib automation system. It provides management and control of perishable and permanent tools, gages, fixtures, dies, punches, shelf life items and other accessories. From a few hundred to thousands of items, this scalable, multi-user system provides the functionality and flexibility efficiently streamlining the usage tracking, inventory management and acquisition processes. Each item in CRIBWARE has a unique part number maintained in the database. This number becomes your bar code for automatic identification purposes. In addition to the part number, seven descriptive fields are available to further identify and characterize your inventory. 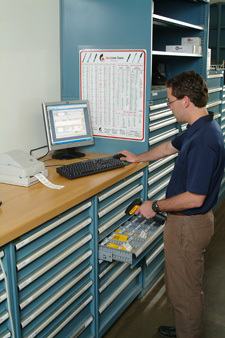 Inventory control is a primary component of the CRIBWARE system. It maintains all item information and inventory balances, and plans and controls all materials, resources, tools and references needed for your processes. Item set up, Check out, Check in and Vendor selection are the activities performed by this component. Tracking items on a real-time basis provides item location information, cost and usage accountability. Track items by employee, department, machine, job, operation, work order, work order task, asset and/or two user defined fields. Customize the check out/in processes for each location to suit organizational needs by selecting one or more tracking parameters and editing the field names. Replenish items using order point or max point calculations. A Reorder report can be used for replenishment or passed to other purchasing or administrative systems. Group items for easier and faster issues and returns. Manage the material workability process. Know the status of your repairs and regrinds. Assign complete bill of tooling requirements for jobs, listing all required components to perform jobs and their individual operations. Track job costs, document operations and assure availability of tooling. Track material transfers between crib locations and document the results. Facilitate new item setup during Compensate for record human and process errors by cycle counting. Record inventory changes for inventory accuracy analysis. CRIBWARE data mining provides over 400 reports for accurate monitoring and review of the entire tool management process. CRIBWARE Self Serve is a designed for ease of use with single purpose screens optimized for bar code usage. It provides check out, check in, receiving and inventory adjustment functions for use in manufacturing cells, storerooms, maintenance departments, tool rooms and other locations that do not have dedicated crib personnel. These simple operations reduce training needs. Each CRIBWARE user may be setup with four levels of security for each CRIBWARE function. This security system maintains the integrity of the system and its information by restricting access based upon the users needs. Import, Export, Database Rebuild and Purge, Remote Price Update, Balance Quantities and Period Closing utilities are included with every CRIBWARE® system. CRIBWARE bar code technology offers simple, accurate and cost effective data collection. The wedge barcode reader is an effective tool for entering usernames, passwords and item part numbers. Additionally, easy one-step printing of bar code labels are available within the CRIBWARE system.